This holiday season, caffe d’bolla is giving a slice of Heaven to our four footed friends! 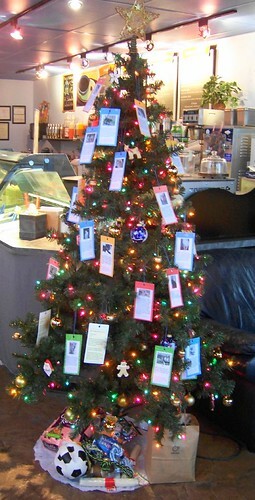 caffe d’bolla is hosting an angel tree to support the needs of the animals at No More Homeless Pets. Frisky felines and playful pups need food, treats, toys, blankets, and most, a home. Yiching has made ornaments out of the photos and profiles of the pets that need homes, and you can pick up an ornament and fulfill a homeless pet’s wish. caffe d’bolla will reward the fulfilling of gifts on the angel tree with lattes, in-house fresh-roasted coffee, and gift cards. caffe d’bolla continues to be dedicated in helping homeless pets and is donating time, effort, money, and tasty drinks for a ‘Good Cause for Paws’. Come help bring plenty of wags and purrs this holiday season!